I have been a professional dog photographer since 1991, when I decided to leave my staff photography job and become freelance and specialise. Q: How did you start as a dog photographer? I had been working as a professional photographer since I left college, but decided to specialise, as dogs really were (and still are) my life. I had got to the stage with my staff job, where I was fed up with photographing the same thing year after year....mainly mayors opening village fetes and visiting royalty for the local newspaper, and knew it was time to branch out on my own. I’m mainly known for gundogs and hunting breeds. 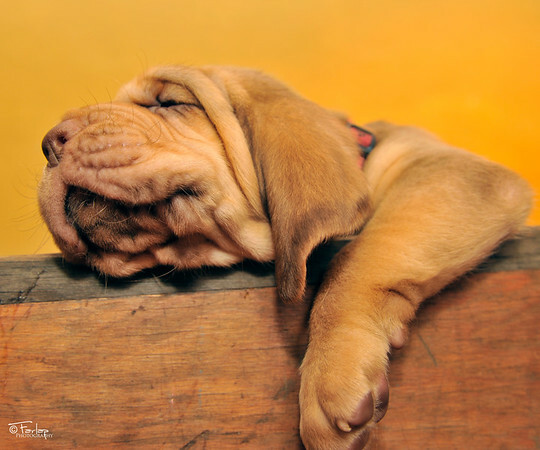 However I probably have more images of bloodhounds than any other breed. I really don’t have a favourite. Many of my photos are special to me for different reasons, either because of the dog involved, or the technical difficulty of getting the shot and so on, but I suppose this one of a Labrador retrieving a pheasant through water is a sentimental favourite as it was one of the images that won me the coveted award of “UK Sports photographer of the year 2007” it’s not technically brilliant, but I was very proud to get the award. Yes! It’s essential that you have a good understanding of dog behaviour and body language, and can empathise with them, interact with them, and be fully aware of when they are comfortable and when you need to stop. You should also learn basic breed standards of the breeds you are working with so you know how to emphasise the best assets and reduce the appearance of faults with careful composition. Even if you are photographing pet dogs and working dogs, it’s still important to recognise the breed type and do your best to capture it correctly. However before you start any of that, learn about professional etiquette and learn about protecting your copyright. So often now we see people starting out, turn up at events without seeking permission from the organiser. Respect the fact the professionals working at these events have to make a living and you will not get any help from them if you tread on their toes. Another modern problem is sharing and giving away photos on social media. Doing this just reduces the value of your images to worthless, and your reputation for the future will be ruined. For me, it’s the fact that I get to spend more time with dogs than people. I find interacting with dogs is very rewarding, and because I have a passion for dogs being “fit for function” then I get to spend a lot of time seeing dogs working, which for me, is my idea of a perfect job. For example this week I am spending three days with a gundog trainer photographing litters of puppies plus adults, for a magazine series on training a new gundog, then the latter half of the week I have clients coming to my farm, with their various dogs for a photoshoot for an American calendar company. I wouldn’t swap that for an office job! Q: Are you working on any new dog photography projects that you would like to talk about?